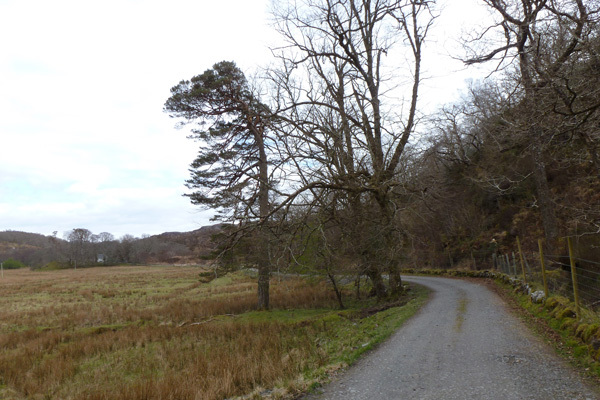 A lovely gentle stroll along farm tracks around the Strath of Arisaig with good views of the surrounding hills, canal and Loch nan Eala. 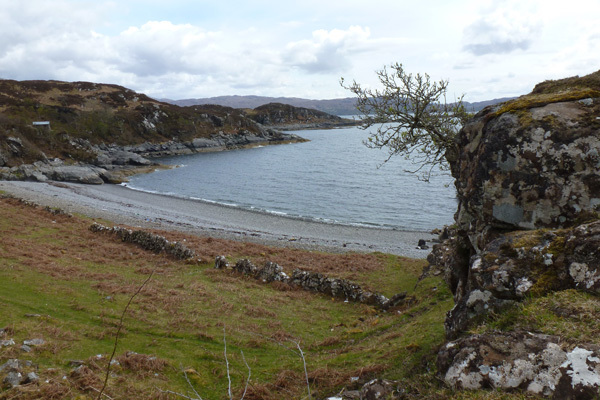 There are also some fine views of the shoreline of a sea loch, Arisaig and the Small Isles. 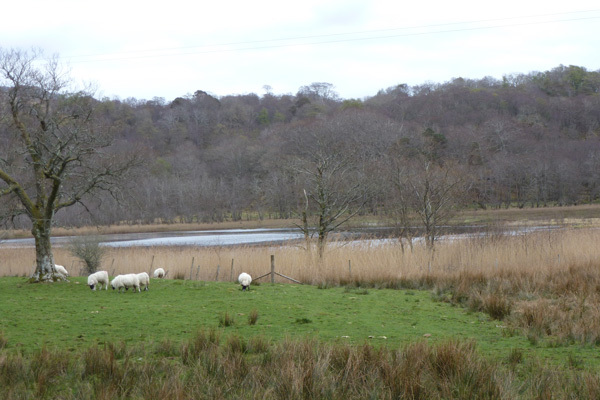 Look out for a range of woodland and farmland birds on route, as well as dabbling and diving ducks and warblers associated with the loch. There are some fine specimen beeches and oaks along the canal side. 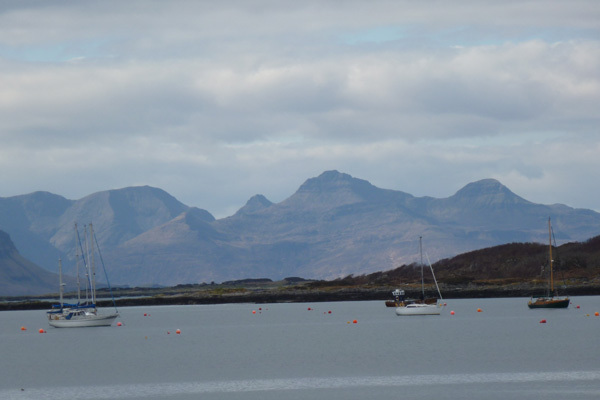 Look out for otters, a variety of waders and sea ducks on Loch nan Ceall and the Sound of Arisaig. 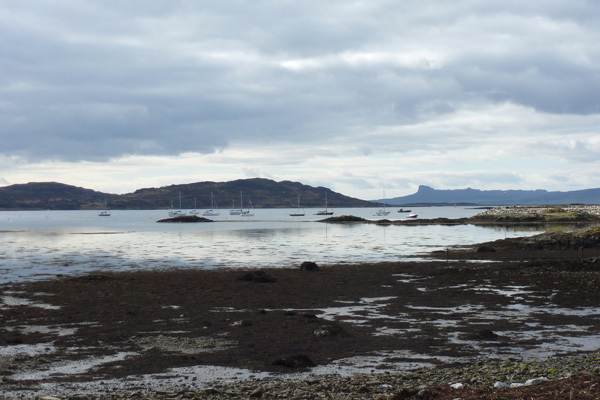 There is an optional detour to the secluded bay of Camus Ghaoideil with fine views over the Sound of Arisaig to the hills of Moidart. The detour also passes by a flat boulder of mica schist with cup marks consisting of numerous concave depressions of various depths. The origin and purpose of cup and ring markings is unclear, although some have been associated more recently with folklore. 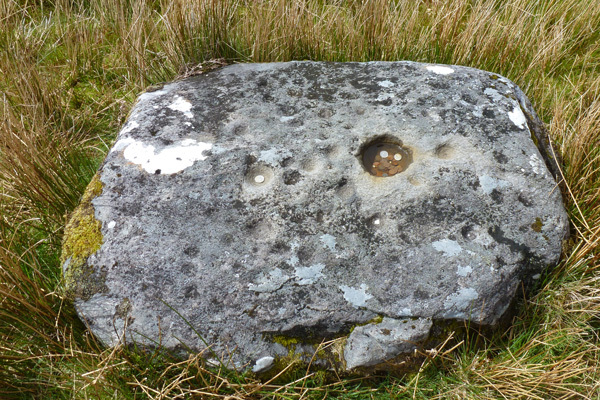 For example, the cup marked stone may be connected with the acquisition of skills and strength by apprentice blacksmiths who would wash their hands in the largest cup mark at sunrise on 1st May (see Yorkshire Rock Art). Most cup and ring markings are believed to date from around 4000 to 5000 years old (Neolithic and Bronze Ages). 1. 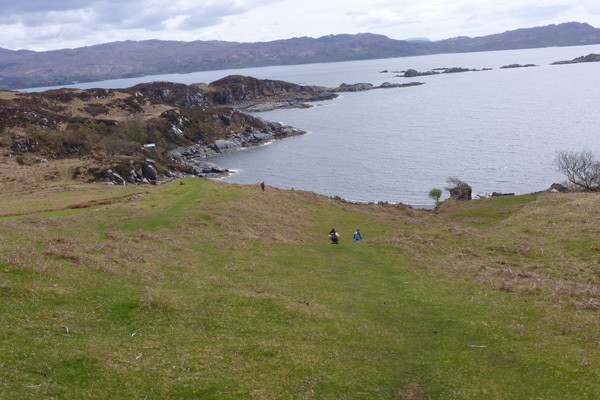 Park in Arisaig and take the Rhu road by the edge of the sea loch, Loch nan Ceall. The route passes through a small reed bed of Phragmites australis, heading southwest towards the Arisaig Canal. 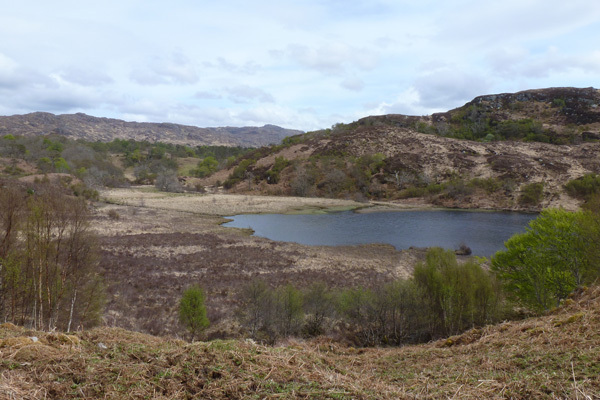 The small canal, which cuts through metamorphic rock, was formed from a burn emerging from Loch nan Eala. 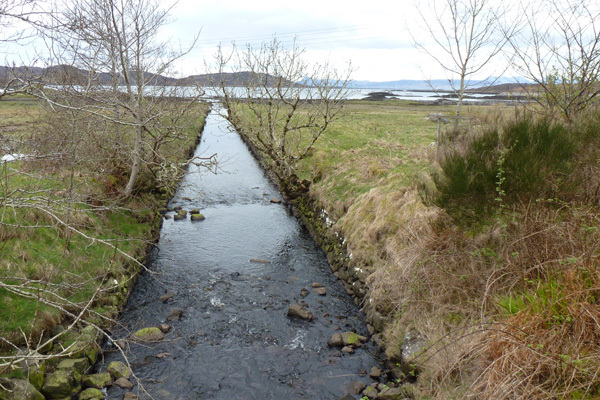 It allowed sawn timber from the sawmill at Mains Farm to be floated to the sea loch. 2. Cross the canal and turn left at the cattle grid, just after a pair of metal gates, heading down a gravelled track. The track follows the canal, with rough pasture merging into oak-birch woodland on the right. There canal side supports some fine old specimen trees of Scots pine, beech and oak, mixed in with some holly and hazel. The track passes by Mains Farm with its sawmill on the left and some agricultural buildings on the right. 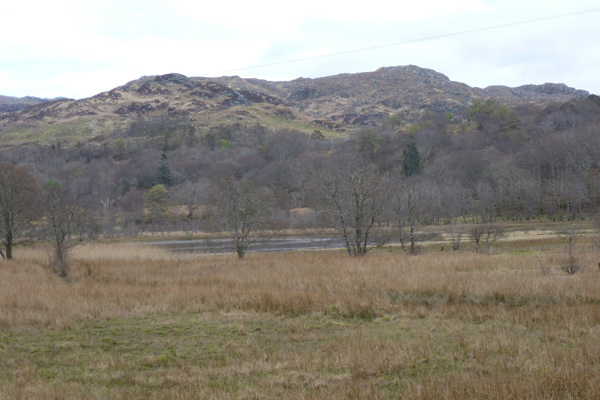 The track diverges away from the canal but soon affords good views of Loch nan Eala (Loch of the Swans). Look out for warblers and reed buntings in the reed beds of Phragmites australis. The track continues through rough pasture skirted by mixed deciduous woodland, strewn with bryophytes and lichens. There are also good views of the wood fringed hills ahead. 3. Pass through a gate, where the track meanders by Pheasantry Cottage. 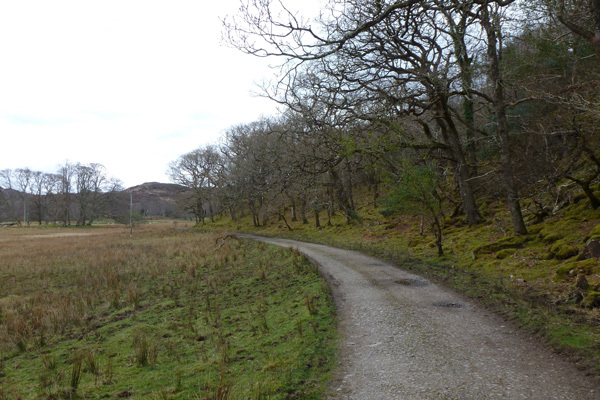 At the crossroads, just in front of a large white house (Glen Cottage) , turn right along another gravelled track. There are good views across open pasture to the right and a fenced off area of birch oak woodland to the left. The latter has a fine Calluna-Vaccinium understory with an abundance of Blechnum spicant (hard fern) in places. There are also some fine planted specimen trees lining the track on the right with diverse lichen communities. There is an optional detour at point 3. 4. Cross the cattle grid by a large stone built house with lovely gardens (Faire na Sgurr). Look out for the diverse Graphidion lichen communities on the hazel stands at the boundary of the garden. The verges also support an abundance of bluebells (Hyacinthoides non-scripta) in the Spring. 5. At the end of the track, turn right onto the road. 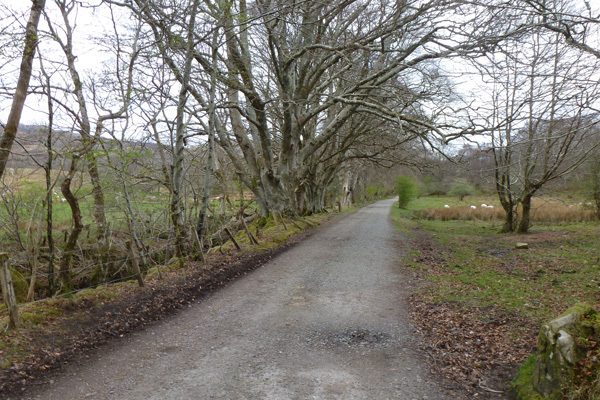 The road skirts round the shores of Loch nan Ceall with some lovely tree-lined sections. The coastal wood fringe consists mainly of birch, oak and hazel, with a resplendent ground flora of bryophytes, lichens (especially Peltigera spp), Luzula sylvatica and spring flowers such as bluebells, primroses and wood anemones in places. 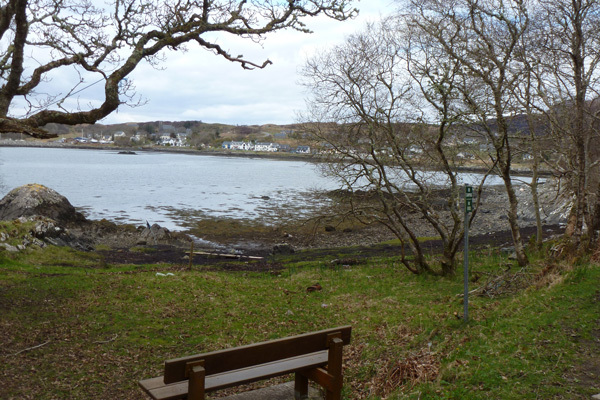 There is a welcome bench on route with good views of the loch shoreline and Arisaig. 6. Continue along the road by some more houses back to the starting points, admiring the coastal views on route. 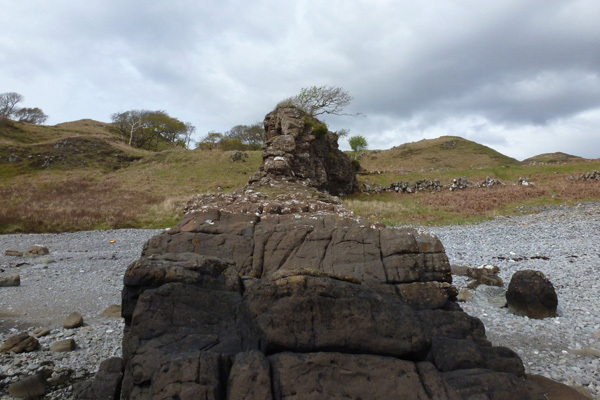 Optional Detour at point 3 to cup stone and secluded shingle beach. D1. At the crossroads in front of a large white house (Glen Cottage), turn left onto a muddy track which skirts the side of the house. There are some lovely hill views. D2. Pass through a gate to continue on a shaded track with some fine specimen beeches and horse chestnuts. This is a lovely section of the walk. 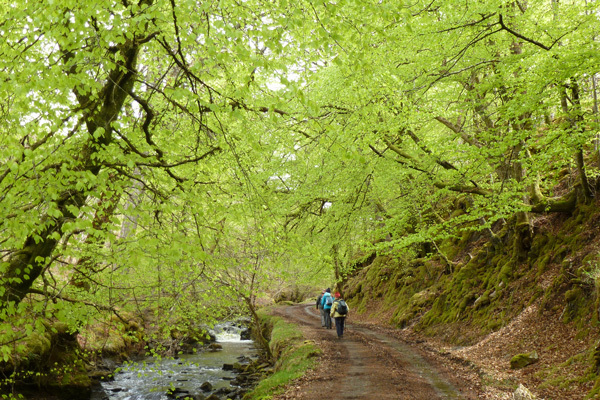 The track follows a tree-lined stream on the left, and with an embankment on the right with beech, hazel, alder and a field layer of ramsons, wood anemones as wellas an abundance of mosses, lichens and ferns. Look out for dippers along the river. D3. Take the track on the right passing through a large metal gate. 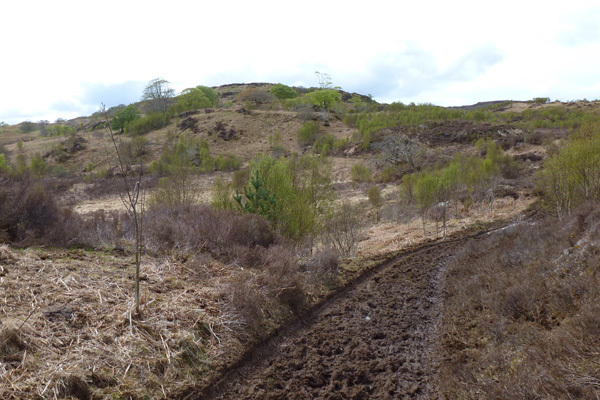 The path rises gradually on a very muddy path (due to poaching by cattle) through rough pasture and/or heath with some birch and willow encroachment. There are some lovely views of Loch Dubh (Black Loch) on the left and the surrounding hills of Torr Mor Ghaoideill and Doire Fhada. 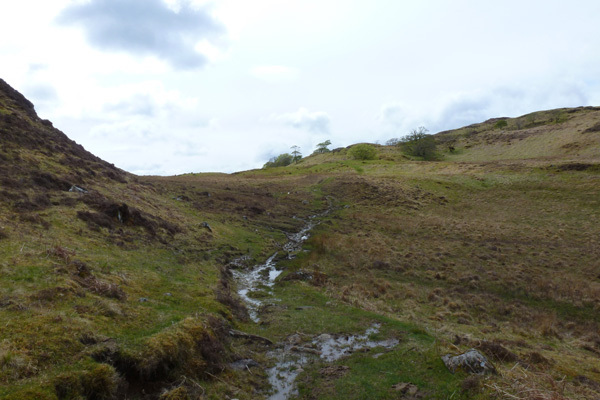 There are a few minor streams crossing on route, and the path can become a little indistinct in places. D4. Pass through another metal gate and follow a stony/mud path uphill across grassland. 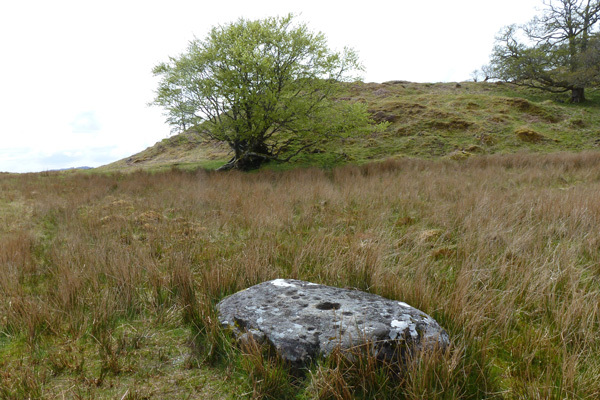 As you near the brow of the hill look out for a flat boulder that is peppered with circular hollows- the cup stone. The stone is on the right just in front of a large fallen beech tree and grassy knoll. D5. 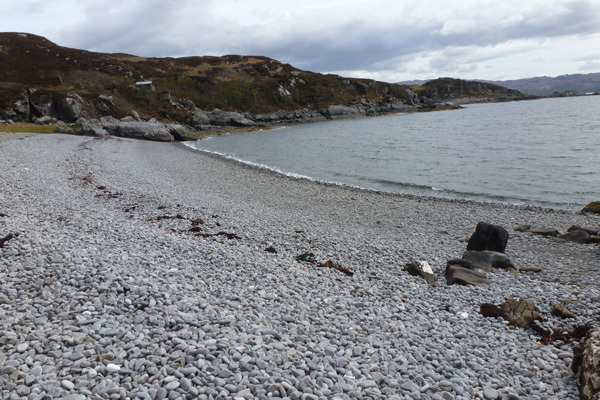 Take time to examine the stone before continuing on to a shingle beach, once you have reach the top of the hill, following a faint path down to the lovely sheltered bay, Camus Ghaoideil. The path traverses grassland dotted with bluebell, primrose, lesser celandine and wood sage, with yellow flag iris, meadowsweet and bog myrtle in the wetter areas. There is also considerable bracken encroachment. Look out for the tracks and signs of pine marten. The shingle beach is punctuated by a massive, heavily jointed, basaltic dyke. The dyke is encrusted with yellow, white and grey crustiose lichens and supports an abundance of barnacles, together with limpets, at its seaward end. Thrift, wood sage, honeysuckle, bell heather and polypody ferns, as well as some foliose lichens (e.g. lungwort), emerge from the crevices and ledges, whilst the upper surface supports Calluna assemblages. Take time to enjoy this lovely sheltered bay and do a little rock pooling. D6. Return by the same route to the crossroads admiring the lovely hill views on your return journey. Continue straight on at the crossroads by Glen Cottage joining a gravel track and pick up the route at stage 4. 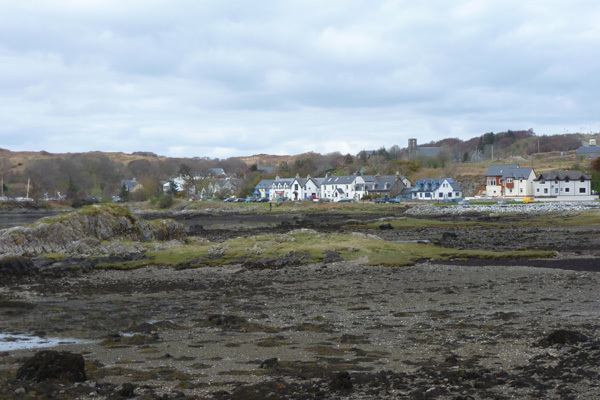 Walk Reference : Walks around Mallaig, Morar and Arisaig. Highland Council Planning and Development Services.